Trials and Tribulations, Part 3 — Houston, We Have Normal Again! 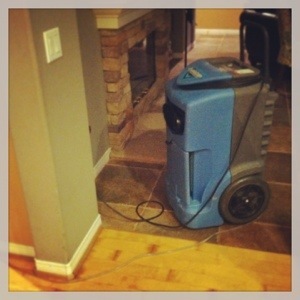 Fans, dehumidifiers, and temporary water heater, oh my! One thing you learn when you have water damage in a home is that there is a whole team of specialists ready to clean up any mess. For these guys, it’s everyday stuff. For me, it was my very first time using them or even hearing about their profession. These guys are the clean-up people. Not exactly glamorous, but to me they are my Justice League. After the plumber came to shut off water, he sent for the mitigation specialist who promptly began the clean-up. By that, I don’t mean just mopping up the wet floor. Nay–they’ve got the tools to cut away at drywall, pull out soggy and moldy insulation, and rip out damaged wood on the floor. They know to make the cuts beautifully and up to industry specification so that the patch work would go smoothly by the next specialist, the restoration guys. After the cutting and removing, my mitigator began the work of drying out the place. He set up several gigantic fans around the family room and garage along with several dehumidifiers and let them rip for five days and four nights, nonstop. The noise was deafening and the electric usage went through the roof, but there was no doubt that these dryers were working, as was evidenced by my indoor plants which quickly dried to a crisp. 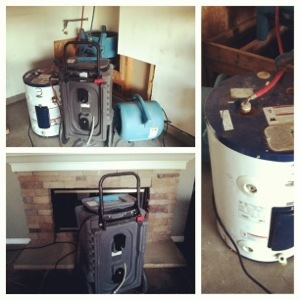 He also set up a temporary water heater so we would have running hot water again. That’s when I almost bent down to kiss his feet. But I held back. “I’ll be back after the weekend to retrieve the fans and stuff. You have to keep them on at all times.” With that, my hero rode off into the sunset. Meanwhile, David and I had plans to go to Seattle for the weekend without our children to celebrate our wedding anniversary. We originally had planned to leave them at home to fend for themselves — they are 15 and 12 now — for the very first time, thinking that they are mature enough to handle the weekend on their own, but I started to have some reservations after our episode with the busted water heater. What if the fans caused an electric fire? What if there is another water leak? What if the kids lose their hearing by the fan noise? I began to wonder if our second honeymoon plans were all going by the wayside. That’s when our friends stepped up to help us. They each volunteered to take in a child for the weekend so David and I could go away. Bless their hearts! After we boarded the dog, we hopped on a flight to Seattle. It was remarkable how the noise of the jet inside the cabin sounded just like my family room back home. On our way to Seattle! 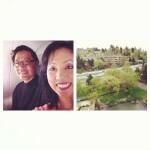 Well, we’re happy to report that David and I had a wonderful time celebrating our anniversary in Seattle. The kids survived at home, and our home was completely dry when we came home. Josh did have several nose bleeds over the weekend, though, due to the completely dry air in the house. As our short season of trials and tribulations come to a close, we have all become a little more appreciative of…normalcy. Plumbers, carpenters, mitigation specialists, and others in the trade. Maybe God sometimes makes us experience hardships simply so that we would appreciate the little things in life. It’s so easy to forget that everything we have is a gift from God in the first place. In no time, we begin feeling entitled to everythings. May we never take life — nor plumbers — for granted! 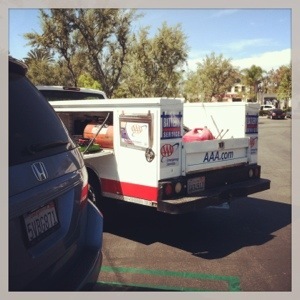 “It’s the hot water heater tank in your garage, ma’am. It blew a hole in the back,” said the plumber, who promptly disconnected the crippled unit and turned the water source back into the house. Great–at least we have running cold water again! We had spent the previous 24 hours pretty much without running water. 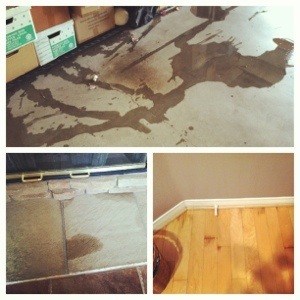 We could tell there was some sort of a water leak in the house but didn’t know where. In order to avoid more damage to our drywalls and wood floor, we just shut off the water valve into the home and only occasionally turned it back on in short, 2-minute intervals until the plumber could come the next day. Going without running water is eye-opening for those of us who live in the developed world. During one of our brief “water-on” moments, we’d fill up as many pots, pans, and buckets we could with water so that we could 1) wash hands, 2) flush toilets, and 3) wash dishes and utensils until we could get to the store to buy disposable paper and plastic goods. I ditched my plans to cook dinner at home that night and skipped past even the thought of take-out. Instead, we went out to eat at a nearby Marie Calendar’s, reminding everyone in my family to please stop by the bathroom afterwards at the restaurant. We would have washed our hair in their sink had we remembered to bring our shampoo to dinner. Flushing toilets became an artform. You can get two flushes out of the commode even without running water, but after the second time you will have to eventually refill the cistern. It was a chore to pour water into it without splashing, but the floor was already ruined downstairs anyway. The toilet tanks are not designed nor well-positioned to be refilled by hand. “Kids, use the downstairs bathroom only, please! It’s too much work to haul water upstairs to refill,” became our mantra. When it was time for us to shower, David went to the garage to turn on the water valve and started the stop watch. We had the kids take the quickest showers on record, but even then we could see the water seeping in through the walls during the few minutes we turned water back on. I chose to skip the shower until I could get to the gym in the morning. David then shut off the valve again, we mopped up the extra water splashing on the floor, and we all went to bed. When the plumber arrived the next day, I almost wanted to hug him. As you can see in the photo above, the wood floor was already pretty much ruined. I have always known that many people worldwide live everyday without running water, but now I got a little taste of that kind of a lifestyle. Up to 6,000 children under age 5 die every day from illnesses related to a lack of access to clean water. A lot of children spend their days hauling water from the nearest water source which might be a mile or more away, weighted down with heavy buckets of water, missing school. And their water could be contaminated! Our problem was quite temporary; theirs, permanent. We as a family have a renewed appreciation for clean, running water. We think every child of God deserves to have clean water — don’t you? If you want to help provide relief for someone somewhere in the world who needs a better life, click on this link to find how you can work with World Vision to help give someone access to clean water. You could do this for as little as $20 a month. So, now that we have cold running water, life was improving for us. Will we get HOT water again, ever? For that, you’ll have to stay tuned to my next post! By all accounts, it has been a rather crazy last few weeks at the Cheng household. One thing after another kept going wrong, costing us time and money in the process. While realizing that nothing we experienced compares to the true suffering that many others are going through at this time, I write this post as a way of explaining why I have been silent these past few weeks, and maybe get some sympathy from you in the process :-). Earlier this month, we had a lovely lunch celebrating Josh’s 15th birthday. 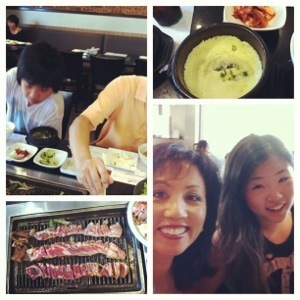 We ate at a nearby all-you-can-eat Korean barbecue place, Josh’s favorite. After the celebration, we came out to the parking lot and got into my minivan. To our surprise, the car wouldn’t start. Good thing we weren’t far from home. My husband and kids walked home while I waited for AAA to come help jump my battery, which is what I assumed was the problem. Unfortunately, it was not the battery. It was the starter, which required a tow to the shop. I have never been towed before. 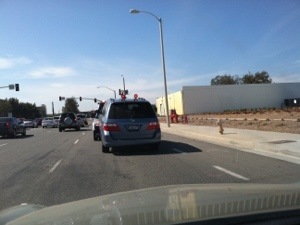 I’m following my minivan being towed by a tow truck. It was a weird sight to behold. The starter, I’ve learned, is way down deep in the engine, so they had to do a lot of diggin’ to get to it. In the process, of course, they uncovered several other problems which required immediate attention due to “some safety concerns” (hate it when they pull out the “safety” card because I know nothing about cars). Of course, it was just after my 7-year/70,000 mile warranty ran out, so I had to shell out $1375 to get my car fixed. Then, Meg spilled water on her MacBook Air. We now know that AppleCare does not cover water damage. Total cost: $800. As I was on my way to pick up the said MacBook, I got a text from my husband who took Meg to get some X-rays on her pinky toe which she slammed into a doorway a few nights prior. 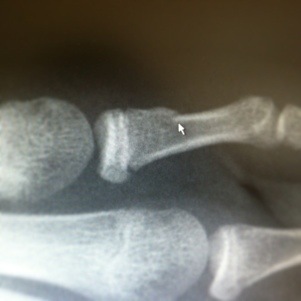 Yup — a broken pinky toe. A fracture. Meg’s dance competitions start in a few weeks, so she will have to go easy but continue dancing until she is healed. Just when I thought things couldn’t get any worse, one day last week as I was walking back into the house with the kids after school, Josh pointed at some water seeping up from under the wood floor downstairs. We weren’t sure what it was, but we knew we had to shut off water into the house until we figured out what the source of the leak was. Was it in the pipes? Slab leak? 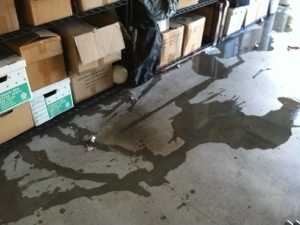 The insurance company said that they we would get an emergency response to this leak…at noon tomorrow. Evidently, our coverage defines “emergency” as anywhere from 24 – 48 hours. Okay, so we had to go with no water for one night. We saved water in buckets so we could occasionally flush the toilet by manually refilling the cistern. “Use the bathrooms downstairs, kids. It’s too much work to haul water up the stairs,” I proclaimed. First world meets third world. We hunkered down and went to bed. “It’s only money. Honey, it’s only money,” I kept repeating to David, but mostly to myself. What will the morning bring? What will the plumber say? What are the kids thinking as they watch their mom and dad’s reactions to all these things? “Uh-oh, I’ve got a pimple!” I sighed while getting ready to volunteer at a book fair at my kids’ school. I tried to brush my bangs over my forehead and hide this blemish which sat squarely above my right eyebrow. Acne, thankfully, was not one of my many afflictions during my teen years, so I was surprised that I would get one now…as a middle-aged mom. “Oh well, I’ll let the other moms envy me for being young enough to still get a zit,” I quipped to my husband who chuckled. My life was busier than ever back in those days, what with a kindergartener and a second grader keeping me on the go as a chauffeur, chef, and mom. I barely had time to look at myself in the mirror each day. But I couldn’t help noticing that this pimple was growing. And it hurt! The next day, I noticed another pimple threatening to break out just a hair away. Now, I had two volcanic cousins right next to each other, like Mauna Kea and Mauna Loa on the Big Island of Hawaii. They both hurt so much that they were giving me a headache! He took a good look. What? We have a brown recluse spider living in our home, crawling onto the bed, across the pillows, and onto my forehead to bite me at night? Yikes! I immediately stripped our bed and washed the sheets in extra hot water. I vacuumed every nook and cranny in our bedroom, hoping to eradicate this arachnid before it killed me. I couldn’t help but wonder why the spider liked my forehead so much more than David’s. Research on the internet provided me with more frightening information than I ever wanted about spider bites. Some terms left me with a sense of doom: venomous, necrosis, gangrenous. Ewwww! And on my face? I made my husband immediately drive me to his clinic for a second opinion. I needed another physician to take a look at my necrotic bites on my forehead by a venomous brown recluse spider before my forehead turned into a huge gangrene. The pain kept getting worse, but I couldn’t tell if it was all in my head — er, I guess it was, technically. “Doc, I think that’s shingles on your wife’s forehead,” stated David’s colleague. Shingles? Well, I did have chicken pox as a child. That virus lies dormant inside until something triggers it to manifest itself as shingles. A common trigger? Stress. Gee, who would have thought that a mom of young children would be stressed? Since my shingles were so close to my right eye, they did an eye exam to make sure that I wasn’t also going blind. Fortunately, my eyes were clear, and I was sent home with some topical creams and meds to reduce the pain. This was no ordinary diagnosis, for it did wake me up to the fact that I was putting myself under a tremendous amount of stress, and it was showing up…on my face. I needed to cut back on my activities and to stop trying to be Super Mom. I reduced my volunteering schedule at school and at church, I began to pray and meditate on Scriptures every morning, and I began exercising more regularly. I also hired a housekeeper to help with the cleaning so that I would never have a brown recluse spider moving in. Those volcanoes on my forehead did erupt a few days later to create the telltale blisters that typify shingles. “Now I see it!” exclaimed my husband rather sheepishly. (For a while afterwards, I think he diagnosed every pimple or rash on his patients as shingles.) They left two little scars which are still on my forehead today, several years later. Now, when I look at those shingles scars, they serve as my daily reminder: slow down, stress less. Thank you, Lord, for shingles! Let the Baby Cry It Out? Here’s What Happens 15 Years Later. Our firstborn could never fall asleep on his own as a baby. We did not let him cry it out, although we tried…once. We wondered if we were damaging him forever by rocking him to sleep each night. They turn out just fine. In fact, I think our Josh has turned out better than just fine. He is a sweet, sensitive soul who loves to give great hugs. 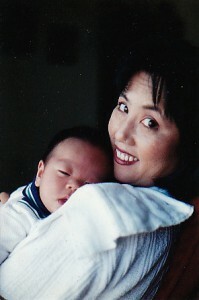 When he was a newborn, he accepted no artificial substitute for a warm body. He hated the bottle, and he threw it against the wall when he was only a few weeks old in a fit of rage one day when my mother was watching him. “I want my Mommy’s milk!” he seemed to say through his tears. He also spat the pacifier right out of his mouth. Only a real human finger, preferably Mom’s, please. We bought a baby swing when he could sit up so that my arms could get a little break from carrying him around. He liked the swing set for about two minutes, but then he demanded that we come back to swing him in our arms. The seat on the swing was too cold, too mechanical. I think my back is forever damaged as a result of swinging him in my cradled arms day after day after day. Night time was the biggest challenge. He had to be nursed and rocked to sleep. We had to then gingerly put him down into the crib without waking him which, of course, he would, and we’d start the whole cycle over again. One time, we were so desperate to get some rest that we actually tried to let him cry it out. We put him down in the crib fully awake, turned on the mobile music box, kissed him good night, and walked out. As soon as the music went through one cycle, Josh figured out that his parents were not coming back, and he began to cry. Then the cry turned into a wail. The wailing then turned downright angry. And loud. I was afraid our neighbors would call the cops on us. Meanwhile, I closed my bedroom door and jumped into the shower so as to drown out my baby’s cries as well as my own. David sat in the hallway outside the nursery, dabbing some tears himself. After about 45 minutes — yes, we really tried and yes, Josh was a stubborn baby — we gave up. We burst into his nursery like two firefighters rescuing a child from a fire. Josh was so upset that he hiccup-cried for another hour. We vowed never to go through this torture again. Yes, we worried that we were creating an insomniac monster. Every time a news article came out about the nation’s state of sleep deprivation and how many heart attacks, strokes, obesity, and bankruptcies could be directly linked to insomnia, we cringed. And we prayed: Lord, please let this child fall asleep on his own! Just any time before he goes off to college. The good news today is that, indeed, Josh can now fall asleep just fine on his own. Honestly, he needed a warm body next to him to fall asleep well into elementary school. He still is a high-contact boy who enjoys wrestling with Dad before going to bed. He still holds my hands while walking the dog together, provided that none of his friends are around to see us. He gives hugs freely to his friends and is a great listener. In fact, he hopes to become a therapist or a counselor someday. His heart breaks for people who are hurting. He has the gift of empathy like no one else I know. So, if you are a parent who is thinking of letting the baby cry it out but has some reservations, we say don’t. Maybe it’s not for you and your baby. Go ahead — love a lot, pray a lot, and rock your baby to sleep. P.S. Happy 15th Birthday, Josh!